'New Horizons' MASAO KAWASOE 7th DAN. Interview By Kenny Taylor. HIDETAKA NISHIYAMA 'The Lighthouse of Traditional Karate'. Stretching Scientifically. Book Review By John Cheetham. 'Beyond Karate' By Bozenna Tedder, S.K.I. (GB) P.R. Officer. Secondary Elements of Kumite. By Steve Hyland. HIROSHI SHIRAI, 'The Man, The Master, The Myth. By Carlo Henke. Purpose Built Dojo in Cork. Chief Instructor Tim Harte. 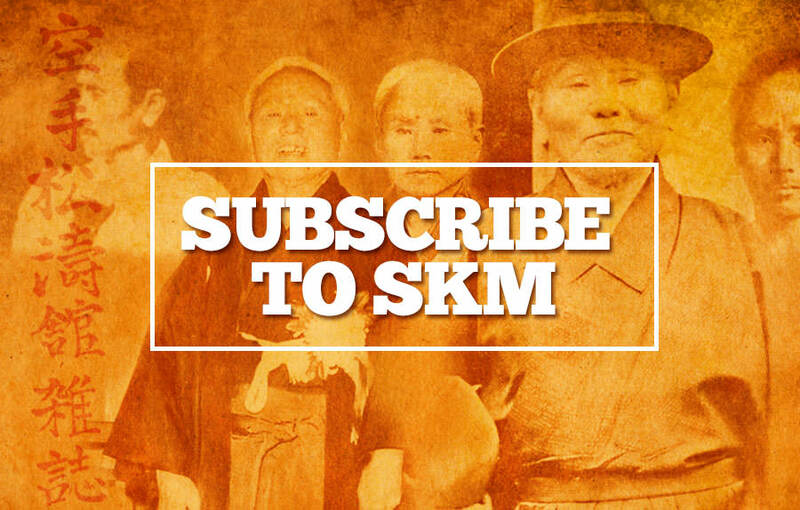 Welcome to the first issue of S.K.M. for 1992. 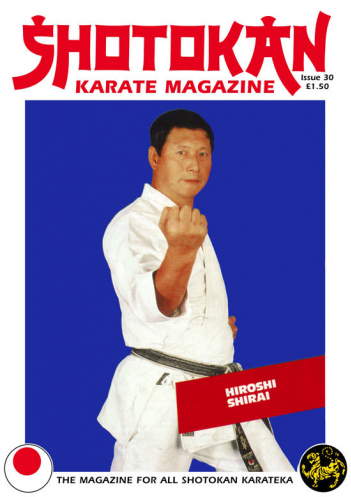 In this issue we have profiles on three of the world's most Senior SHOTOKAN Senseis. Master NISHIYAMA, (the head of l.T.K.F. International Traditional Karate Federation), KASE, (W.K.S.A. World Karate Shotokan Academy) and SHIRAI, (E.T.K.F. European Traditional Karate Federation), as well as a recent interview with Sensei MASAO KAWASOE, the Chief instructor of U.K.T.F. (United Kingdom Traditional Karate Federation). All these Instructors work closely together as you will see by reading all the latest information in this edition. I would like to thank Sensei Shirai and some of his senior Italian students for supplying this material. There's a very interesting Technical article in this issue by Steve Hyland. It looks at a point many instructors will have seen over the years. Namely, that you often get excellent Technical students who cannot get to grips with Kumite (sparring) for various reasons. All these reasons are discussed in Steve's article. Sensei KAWASOE appears in S.K.M. once again and talks about 'Studying Karate with your Gi on'. I think we all know what he means by that remark! Keep training! Boz Tedder's article is most interesting, with all the talk about the 'WAY' of Karate and also a Ladies view on Karate training, with some fine quotes from Master HIROKAZU KANAZAWA. I still keep receiving 'Letters' from both factions of the J.K.A. (JAPAN KARATE ASSOCIATION) and I've purposely 'NOT' included them in this issue. They are still going on about who is the 'REAL' J.K.A. and who is not! From the letters sent to S.K.M. it seems SHOTOKAN people are fed up with hearing about the dispute and the J.K.A. of both sides should take heed. It's such a shame that this split in the J.K.A. has occurred but nevertheless, it has and a lot of Shotokan people have had to make a choice. They are all amazingly talented instructors on both sides of the fence and my advice would be, train with all of them if you get the chance. We can't say in this country that we don't get the very 'BEST' of World Shotokan Masters visiting and teaching here. Just look at some of the courses this year. Sensei ENOEDA's course at Crystal Palace has Senseis TANAKA, TABATA and OSAKA, Sensei KATO's April course in York has Senseis ASAI, YAMAGUCHI, KAGAWA and possibly YAHARA. Then there is Sensei kawasoe's course in April with Senseis KASE, SHIRAI, NAITO, and possibly NISHIYAMA. So, as you can see from this alone, here we have the 'creme de la creme' right here on our doorstep. Most important of all is that all these courses are 'open' to Shotokan or other stylists from any organisation, thank goodness. This is how it should be, as we virtually all agree. An interesting point being, that ALL the above mentioned Japanese Instructors were once part of the J.K.A. as it used to be! I make no apology for all the advertisements in S.K.M. If they weren't there, then there would be no magazine. This is the way all magazines and periodicals survive, unless they are funded by large organisations or whatever. At least they are valid, interesting adverts whether it be for VIDEOS, BOOKS, TRAINING COURSES, MARTIAL ARTS, GOODS, or even the many different SHOTOKAN ASSOCIATIONS who now advertise for clubs to join them. This is all part of Karate these days and like it or lump it, we have to accept it. Good training for 1992. EDITOR.